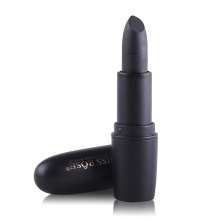 Waterproof and long-lasting moisture matte lipstick with velvet matte effect, and it is with moisturizing ingredients, which can make your lips more nourishing. 100% Brand new and good quality, non-irritating and safe to use. Long-lasting & waterproof, not easy to fade, and the effect can last for a long time. With velvet matte color effect, but it won&apos;t let you feel dry, comfortable to wear. Also with moisturizing ingredients, making your lips more nourishing. Portable size, very easy to carry.